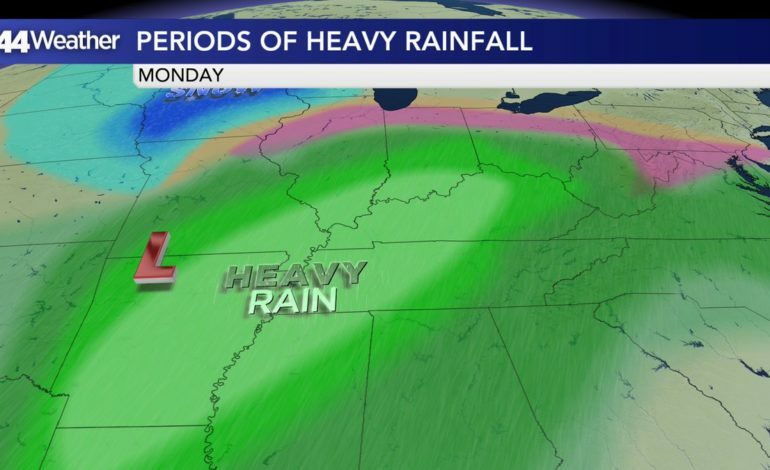 It’s Monday, it’s rainy and soggy across parts of the Tri-State. Unfortunately we are in for a soaking rain over the next 24 to 36 hours. The heaviest rainfall so far has been south of the Ohio River where over an inch has fallen over the last 24 hours. A stationary front right over the area is the culprit for this rainfall. Areas of rain will continue riding along that front throughout the day with the heaviest rainfall over southern portions of the region. The area of heaviest rainfall will shift northward this evening as a warm front lifts through the area. Temperatures will rise to the mid to upper 40s, with rain, heavy at times and areas of patchy fog. A warm front will move through the area tonight and temperatures will rise from the upper 40s to the low 50s. 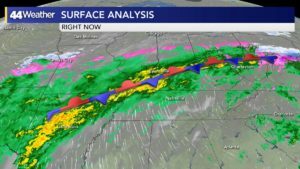 Rainfall will continue overnight into Tuesday, a cold front will move through Tuesday and rainfall will come to an end late in the afternoon through the early evening. Winds will pick up out of the west gusting 30 to 40 mph. 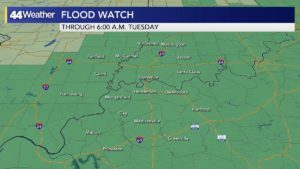 Additional rainfall totals will be 1-3″ with locally higher amounts, flash flooding is possible, south of the Ohio River, but minor river flooding with continue as river levels will continue to rise over the course of the next few days to moderate levels. Drier conditions and the return of sunshine by Wednesday, with temperatures in the mid to upper 40s. 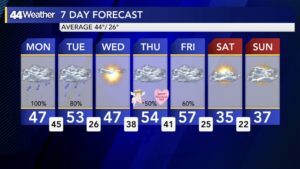 Valentine’s Day at the moment looks cloudy with a few scattered showers, temperatures in the mid 50s. Below average temperatures will arrive Friday Night – Sunday with wintry precipitation possible next Monday.